Just now on my way home I was talking to a friend. 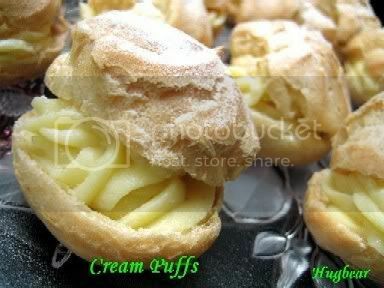 She suggested that I try out this cream puff recipe from Florence's blog. She said it's really nice. So here you are, my cream puffs for tonight. 1. Cook water, butter, sugar and salt in a saucepan till bubbling hot. Turn the heat to low. 2. Add in the flour mixture in one go and mix with a wooden spoon till a dough is formed. 3. Still on low heat, cook the dough for 1 - 2 minutes till a thin white film is formed at the bottom of the saucepan. 4. Transfer dough to a mixing bowl and beat till it is lukewarm. 5. Add in egg by thirds and mix till well blended and smooth. 6. Place batter into piping bag and pipe it onto a lined pan in rounds of about 5cm in diameter. Spray some water on it. 7. Bake at 200C for 25 minutes then 180C for 8 - 10 minutes or till dry and golden brown in color. Turn off the oven and let it cool in the oven for 30 minutes. 1. Mix 60ml of milk with the cornstarch till smooth. 2. Add the beaten egg and yolks into the cornstarch mixture. 3. Boil the remaining milk with sugar in a saucepan till bubbling hot. Pour 1/3 of this hot milk into the egg cornstarch mixture. Stirring all the time. 4. Now pour the egg cornstarch mixture through a strainer into the rest of the boiling milk. Stirring constantly till mixture thicken. Do not burn the custard. 5. Cling wrap custard with glad wrap with the wrap touching the surface of the custard (this is to prevent a hard film forming on surface of the custard) and chill till ready to use. Do not open the oven door in the baking process. Open oven door to remove puffs only after the 30 minutes in-oven cooling process. 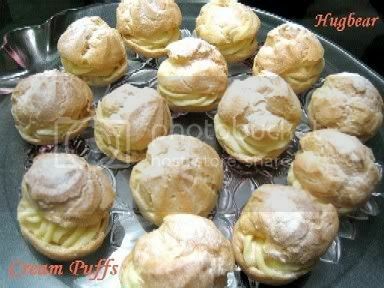 LeeLee, for a moment I thought these were my favourite durian puffs ;p Drooling over these pretty cream puffs! How can I get a copy of your recipe for the cream puffs. They look delicious. I have tried making cream puffs. The puff pastry was ok but I can't seem to get the custard quite the way I like. Can I get a copy of your recipe please? juneliyx@gmail.com. Thanks. Hi let me check with the original owner of the recipe and I will put up the recipe here when I hear from her. Ok, green light given by Florence to post her recipe here. Do let me know how it turn out for you ok? how is florence doing?? is she ok?? Florence is doing ok, recovering well. Could it be because my oven is not a fan force? and i only hv lower and upper rack, nothing in betw lor..
For the creme patisserie, can I use 2 eggs instead of 1 egg + 2 yolks? Reena, you can try but my guess is that it won't be as creamy with so much eggwhite in it. 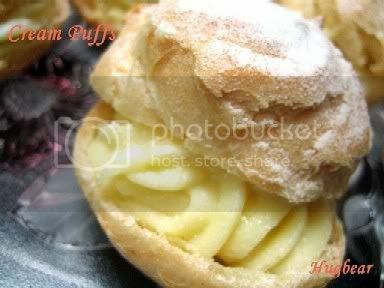 I was searching for durian puffs recipe and came across your food blog. I would love to learn this but I do not have bread flour. Is it possible if I can substitute it with other flour? Such as self-raising flour? Please advise, thanks. sorry to bother you. May I ask if I can substitute it with other flour? If not, I have to go get a packet soon to try out this recipe. Thx. 1st time wasn't too great, but 2nd attempt was much better! Oh gosh Cheryl, I am so sorry that I have missed out your question. You can use plain flour, no problem at all. Hi Missbitchalot, glad it turned out ok for you the 2nd time round. what is the difference between cake flour & bread flour?? can't i use plain flour (wheat flour)? Hi Anu, cake flour is low gluten flour and bread flour is high gluten flour. You can use plain flour (all purpose flour). Hi, do I need to preheat the oven before baking? Hi Ivy, no matter what you bake, you must always preheat the oven. Pls explain step number five. Add in egg by thirds? Pls explain step number five. What to you mean by add in egg by thirds? Hi, step 5 is to add the 2 beaten eggs into the batter in three batches (ie, three times). Hi Hugbear, can I use self raising flour instead? Your cream puffs look so yummy! I have not tried with SRF so I am not so sure if it works. But I guess it should not be a problem. Hi, i've just tried this recipe. I doubled the recipe but end up adding 8 eggs instead of 4 eggs (AA size eggs). What happened was, i read from many books for cream puff making which stated that in order to get the right texture,it should be soft enough to drop from the spoon when tapped.. so i kept adding eggs but it just x drop at all!! I wonder what went wrong cos when i tapped the spoon into batter, it just stay clean. ( The batter just x stick onto it !). As a result of too many eggs, my cream puff has a wet middle part which seems to be uncook though i've baked for 35mins. Kindly advice.. thank you. why need to spray water? Hi bakingmum, is it better to use a piping bag cos I just scoop the dough using a tablespoon. Also, the bottom of the cream puffs keep sticking onto the baking sheet. Is there a solution to this? Thks!!! for the cream recipe, i dont understand the last instruction.. could you please explain? and do you castor sugar or really custard? cz i dont see any custard listed in the ingredients..
Hi Aisyah, which part of the custard instruction that you do not understand. If you cannot get castor sugar you can use just normal fine sugar. This has to be cooked with the rest of the custard filling recipe to the stage when it becomes custard like and thick. Hi Inexperienced, it is better to pipe because you can get almost about the same size for the puff. Also try to use parchment baking paper as it is non-stick. That is what I always uses and nothing sticks. Hi, I wanted to know if cream puffs are supposed to be firm and crispy because the ones I've tried at bakeries were soft when I touch it. Is there a way to make it soft? Usually cream puffs are soft. Should'nt be hard because when it cools down it will turn soft.